Palolem beach, enclosed by a thick forest of coconut palms in far South Goa, is one of the state's most picturesque beaches. This mile-long, shady, semi-circle shaped beach continues to grow in popularity every year and has become very lively with the diverse crowd that it attracts. South Goa, 43 kilometers (27 miles) from Margao (Madgaon) and 76 kilometers (47 miles) from Panaji (Panjim), the state's capital. It's between Agonda beach to the north and Patnem beach to the south. The closest railway stations to Palolem are Margao on the Konkan Railway and Canacona (also known as Chaudi). Canacona is a 10 minute drive from Palolem and the journey costs about 200 rupees in an auto rickshaw. Margao is 40 minutes away and costs about 1,000 rupees in a taxi. Alternatively, Goa's Dabolim airport is around one and a half hours away. A taxi from the airport will cost about 1,900 rupees. You'll find a prepaid taxi counter near the exit of the arrivals area. Unfortunately, popular app-based taxi services such as Uber and Ola have been prevented from operating in Goa by the taxi union. Goa Tourism has introduced a local taxi app called GoaMiles. Don't expect cheap fares though! Alternatively, regular train and bus services are popular ways of getting to Goa from Mumbai. The weather is warm throughout the year. Temperatures rarely reach more than 33 degrees Celsius (91 degrees Fahrenheit) during the day or drop below 20 degrees Celsius (68 degrees Fahrenheit) at night. Some winter nights can get a bit chilly from December to February though. Palolem receives rain from the southwest monsoon from June to August, and most places on the beach close down during this time (including the beach huts, which get dismantled). The tourist season kicks off in late October, and starts slowing down around March. Everyone, from long term travelers to package tourists, seems to have found an appropriate place for themselves on Palolem beach. As a result, there are completely different atmospheres from one end of the beach to the other. The quieter and laid back north tends to attract families, while backpackers congregate in the center and south where the party scene is. The ocean is also gentler in the north and doesn't get deep as quick as in the south, which is safer for small children. Palolem offers both relaxation and adventure. Those who've had enough of lounging on the beach can go dolphin spotting or fishing in a boat, or take an inexpensive boat trip along the backwater canals during high tide. Hiring a kayak is also a good way to explore the surroundings. During low tide, it's possible to walk to Butterfly beach (which becomes an island when the tide is in) where there are hiking trails and striking sunsets to be enjoyed. Cotigao Wildlife Sanctuary makes a pleasant day trip from Palolem. Those who are active and love an adrenaline rush should check out the activities offered by Goa Jungle Adventure. Palolem has a strip of shops just behind the beach that sells the usual jewelry, clothes, and souvenirs. If you're looking to buy something more upmarket and unique, La Mangrove boutique stands out. It stocks a range of funky bohemian beach fashion and accessories. Chef Rahul conducts fun north Indian and Goan cuisine cooking classes at his kitchen on Palolem's main road, behind Cuba beach bungalow. For wellness treatments, Ranjeet Mogu from Himalayan Therapeutic Studio is a renowned physiotherapist with 20 years experience. He combines Ayurveda with massage, reflexology, Reiki and energy healing. His deep tissue work is outstanding. If you're interested in yoga, daily drop-in classes are offered at Cozy Nook, Anand Yoga Village, Bhakti Kutir, Ruban Yoga and Ayurveda Village, Earth Yoga Village, and Dreamcatcher. The feature at Palolem is the temporary coco huts, which line the beach from October until May. Some are more basic than others, and can come with or without a bathroom. This guide to the best Goa beach huts offers some suggestions. In addition, Camp San Fransisco is known to provide some of the cheapest huts on the beach. Ciaran's, located in the middle of Palolem Beach, has well appointed luxury huts in beautiful surroundings. Rooms are also available in guesthouses and hotels set back from the beach. Om Sai Guest House, located at the northern end of Palolem market, is recommended as an inexpensive alternative to the beach huts. Backpackers who want to meet people should head to Summer Hostel by the Hostel Crowd. Alternatively, if the thought of staying in a Goan heritage villa appeals, Turiya Villa is the place! This gorgeously renovated villa is less than 10 minutes drive away in Chaudi, and is home away from home that you'll never want to leave. Dropadi is possibly the most popular shack on the beach. It serves up an array of cocktails, wines, and seafood accompanied by a mesmerizing ocean view. If you've had enough Indian cuisine and want something different, you'll find yummy European fusion food at Ourem 88. Book well in advance during the busy tourist season! For a delicious cup of chai or juice try Little World. This hidden gem has just a few garden tables and a wonderful ambiance. Cafe Inn, on the main road behind the rickshaw stand, does an epic western breakfast. The Space Goa caters to the heath conscious, with organic and vegan food. It's located on the road between Palolem and Agonda beaches. Zest is another popular option that serves healthy vegan food. 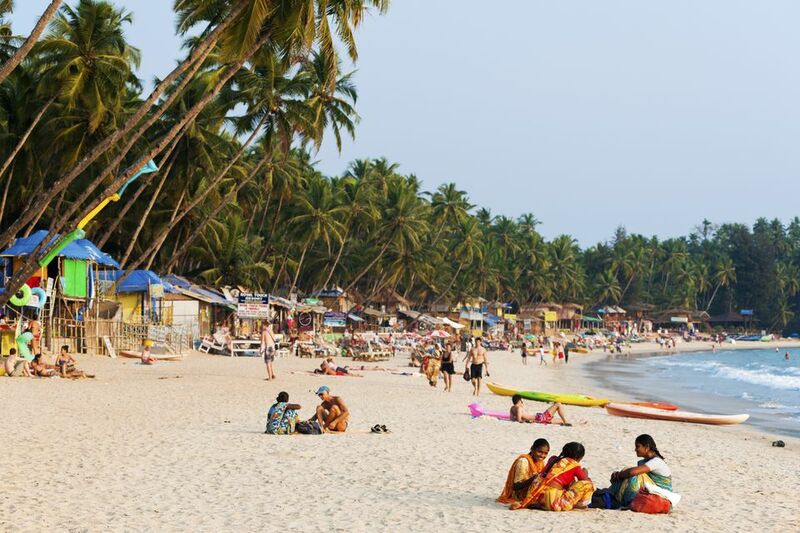 Although Palolem is the most happening beach in South Goa, don't expect much nightlife. South Goa is known for peace rather than parties. One exception is the Silent Noise Parties that are held every Saturday night at Neptune Point, the rocky peninsula at the southern end of the beach. You may also find some action at Cafe Del Mar and Silver Star - Cocktails & Dreams (yes, it is based on the movie starring Tom Cruise), as both places have 24-hour licenses. Alternatively, go to Leopard Valley on the Palolem-Agonda Road to dance the night away. It's South Goa's biggest outdoor dance club. Many people wonder whether they should book their accommodation in advance at Palolem, or just turn up and hope they find a beach hut. If you're not too fussy about where you stay, it's possible to do the latter. However, the good places do fill up quickly during peak season in December and January, so booking ahead can be wise. Make sure you bring a flashlight and mosquito repellent. A sweater can also come in handy during the cooler months.